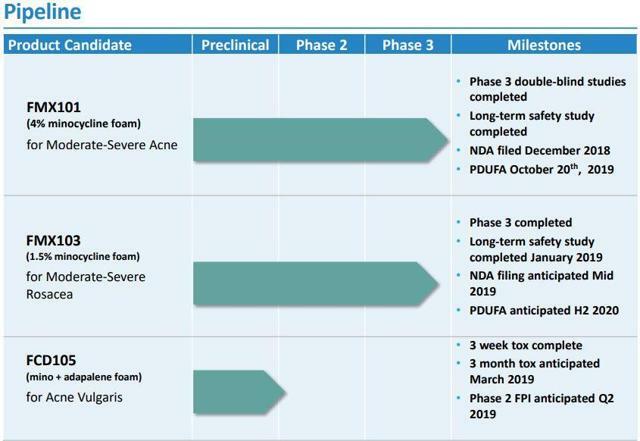 Foamix Pharmaceuticals is preparing to submit FMX103's NDA for the treatment of papulopustular rosacea. Management expects to submit to the FDA around mid-year. The company's FMX101 candidate for moderate-to-severe acne has PDUFA date set in October of this year. The NDA is supported by two Phase III trials that demonstrated positive safety and efficacy. Foamix has outlined their targeted commercial strategy for FMX101 and FMX103. I review how this strategy is appropriate for Foamix as they aim to be a leader in the dermatology arena. I present some potential downside risks that should be considered by investors looking to enter FOMX in the coming months. 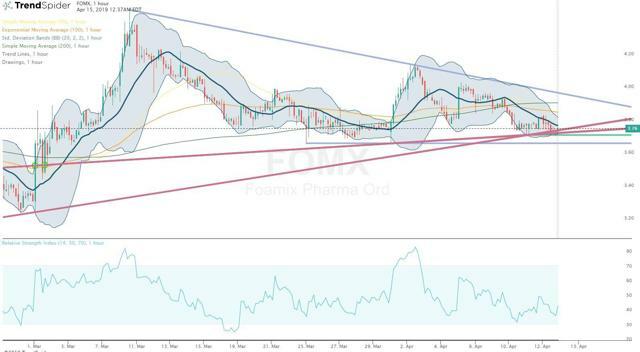 It looks as if 2019 is set up to be a transformational year for Foamix Pharmaceuticals (FOMX) with a potential conversion from a developmental stage to commercial-stage biotech. The company reached a key milestone in December with the filing of their first NDA for the company’s FMX101 candidate for acne. Foamix has been given a PDUFA in October of this year, and if approved, expects a commercial launch soon after. In addition, management intends to file an additional NDA for their FMX103 product candidate in the middle of this year. At this point, the company still holds global rights to both of their lead candidates and has amassed a team that is very qualified in development and commercialization to bring it to market. Foamix management has confidence that both of these products have the capacity to address major unmet needs the large dermatology patient population. I intend to review the company’s products and strategy for its anticipated commercial launch for FMX101 and FMX103. In addition, I provide some downside risks that investors should take into consideration. Additionally, I analyze the charts and present my case for buying before the scheduled catalysts. Finally, I declare my price targets for 2020 and my terms for holding FOMX for the long term. Foamix Pharmaceuticals is an Israel-based pharmaceutical company that is motivated to develop and commercialize topical treatments for dermatological conditions. Foamix’s market cap is roughly $200M and is trading around $3.75 a share. The company’s pipeline is made up of several drugs but it is their FMX101 and FMX103 that are the company's two lead drug candidates. 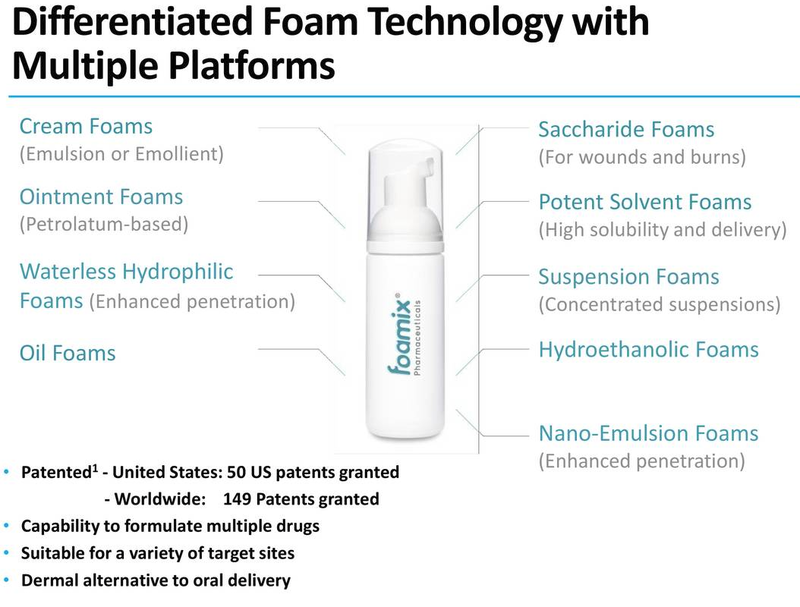 Foamix is leveraging its proprietary foam technology to support a variety of original topical products for the management of dermatological disorders. Back in September, Foamix executed a public offering of 11,670,000 shares that were priced at $6 a share, which engendered approximately $80.5M of funds. At the end of 2018, Foamix had $99.4M in cash and investments, which the company expects that this will be adequate to fund strategic expenditures and operating expenses through the middle of 2020. FMX101 is one of Foamix’s lead product candidates for moderate-to-severe acne. The company submitted FMX101’s NDA in December under the 505 “b” “2” pathway which is backed by two Phase III studies that met co-primary endpoints. FMX101 demonstrated statistically significant augmentations in lesion count (Figure 2) and investigator global assessment treatment success (Figure 3). In addition, FMX101 displayed an encouraging safety profile of FMX101 that was maintained all the way through the clinical pathway. FMX103 is a foam formulation of 1.5% minocycline for the treatment of moderate-to-severe papulopustular rosacea, a chronic skin disease causing inflammatory lesions on the face. 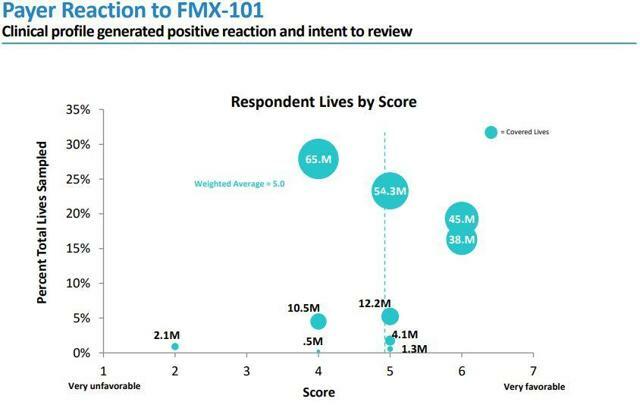 Earlier this year, Foamix publicized marks from the company’s long-term open-label study, which evaluated the safety of FMX103 therapy for an additional nine months with some subjects going up to one year of treatment. 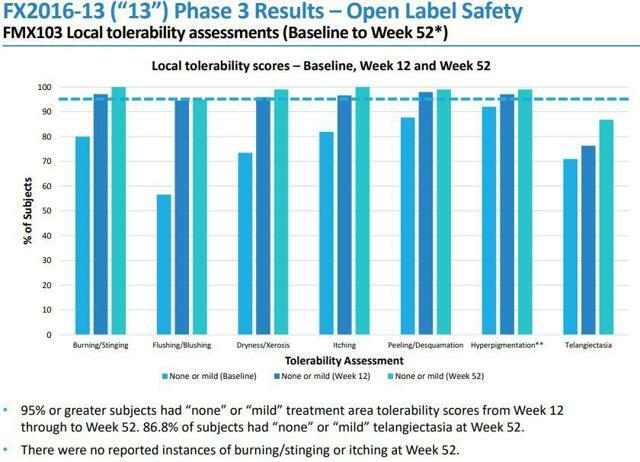 The company reported treatment tolerability was comparable to the previous studies and there were no treatment-associated serious adverse events (Figure 4). 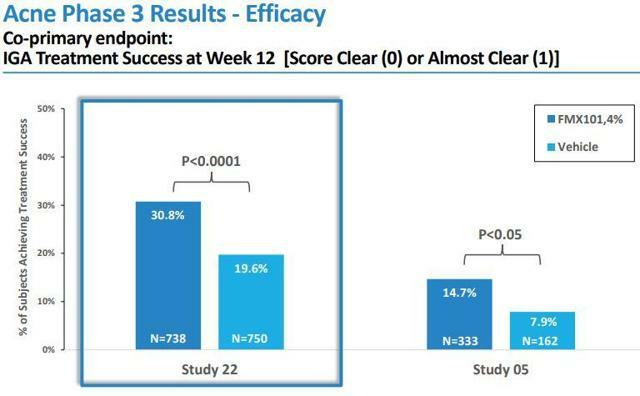 The company should be exhilarated to see that both co-primary endpoints used in the double-blinded studies improved over the additional nine months. 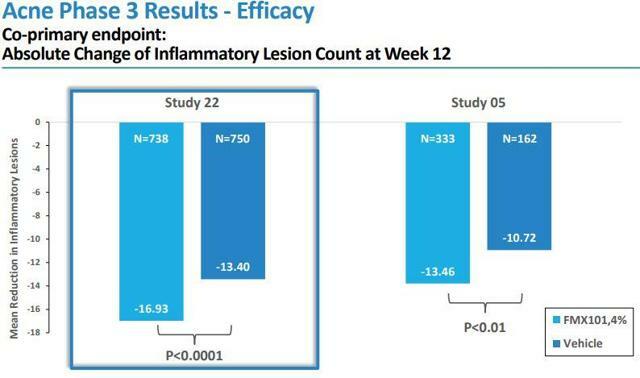 The data showed that subjects who maintained treatment for up to one year experienced in excess of 80% reduction in inflammatory lesion compared to their baseline values (Figure 5). 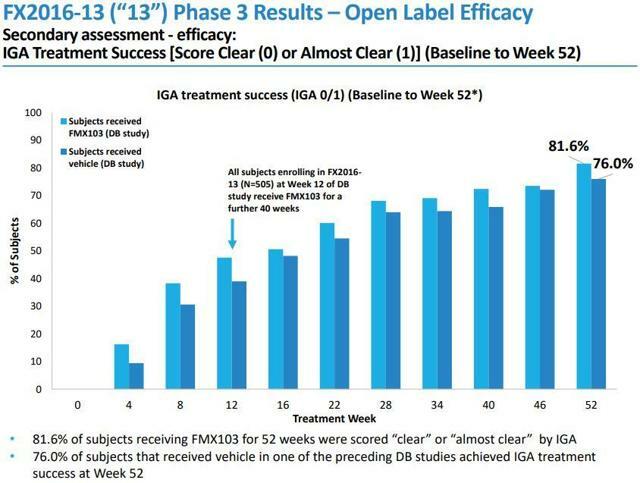 Furthermore, over 80% of subjects’ IGA score was either “clear” or “almost clear” at the conclusion of the study. I’m obviously very impressed with the results of this study because it shows that patients should see long-term benefit with FMX103 with comparable safety profile seen in shorter-term studies (Figure 6). Now the company’s attention focuses on preparing an NDA submission package with an expected submission in the middle of this year. The company has recently started to push forward with FCD105; a combination of minocycline and adapalene foam product for the treatment of acne. Foamix believes the combination of Adapalene with minocycline might provide an alternative topical treatment for acne. The company has completed the initial nonclinical toxicity evaluations and has already requested a pre-IND meeting with the FDA and has prepared their Phase II study protocol proposal. Foamix intends to initiate its Phase II study at some point in Q2. Although I am focused on the two leading products, it is assuring that the company has another acne product in the works that can keep investors excited about the potential growth of the company. Although the company has a few proprietary product candidates, the company’s foam technology is the key to the company’s success. In fact, other companies have employed Foamix’s foam technology to create some notable dermatology products. 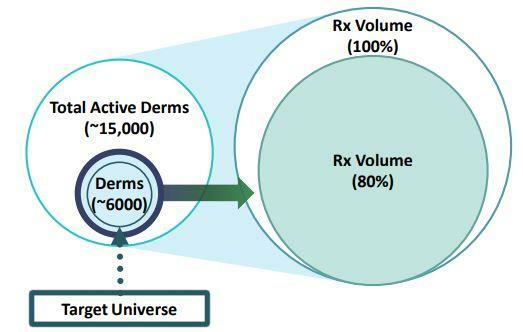 Looking at figure 7, we can see the possible applications for the company’s foam technology that could be used to create new in-house products or out-licensed to other companies looking to create novel dermatology products that could be another source of revenue. In fact, back in 2014, Bayer (OTCPK:BAYRY) and Foamix signed a licensing deal for Bayer to use Foamix’s foam technology in a dermatology product called Finacea. On September 4, 2018, LEO Pharma acquired Bayer’s dermatology line, which included Finacea. In 2018, Foamix recorded a total of $3.5M in Finacea sales royalties from both Bayer and LEO. Obviously, $3.5M isn’t going to fill the bank account but every cent counts when you are preparing for a commercial launch. FMX101 will be launching into a sizable and durable market opportunity (Figure 8). In the branded acne market alone in 2018, there were over 5M prescriptions written in the U.S. which produced around $3.7B in revenue (Figure 8). The company has performed market research with ten payers and their reaction to the FMX101 product profile. Overall, the reaction looks to be encouraging with the mean score being 5 out of 7 on a favorability scale with only one payer recording a negative score (Figure 10). In the Q4 earnings conference call, Foamix CEO David Domzalski revealed that the company intends to employ a sales force of ~50 reps to target ~5000 dermatologists. Although this is a conservative approach, those physicians account for approximately 80% of the diagnosed patients in the United States (Figure 11). In addition, the company believes a 40-50% physician overlap exists with Rosacea patients (Figure 12). This strategy will allow the sales force to focus on the biggest prescription writers and hopefully establish a relationship with these providers that could make FMX103's launch much easier. In addition, the smaller sales force will prevent unneeded expenses that would hinder the growth of the company. Looking back at figure 9, we can see that previous acne products experienced rapid script growth in the first few months of launch. 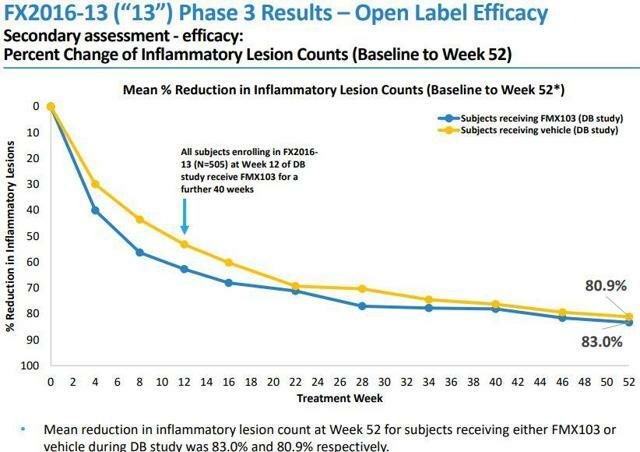 If the company can match those trajectories, I expect Foamix will rapidly become a respectable player in the dermatology arena. However, it is not easy for a small-cap biotech to launch their first commercial product, especially "going it alone." Not only is there internal organizational and logistical problems to be sorted out but the company has to influence payers, providers, and patients that their product is the better option than the contemporary. Without these three parties accepting FMX101 and FMX103, we might see a lackluster launch and subsequent shareholder fallout. This puts the pressure on management to start executing on their strategy the moment approval is in hand. The charts are indicating the share price is going to make a significant move at some point in the coming weeks. The daily chart (Figure 13) shows the share price is near 52-week lows but is starting to move away from the downtrend lines and possibly start its ascent as it moves closer to the upcoming catalysts. The hourly chart (Figure 14) is hinting that the movement is going to happen in the near future and I am putting my money on a breakout rather than a breakdown. Of course, the overall market might have other plans, but even if there is a sell-off, I have to expect bargain hunters will see the opportunity to buy-in before a major binary event. 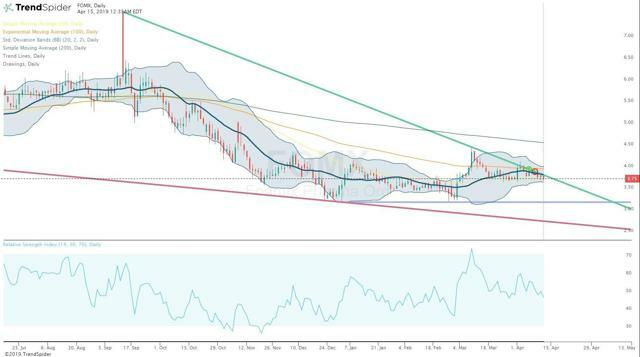 I will wait for the share price to break above the top downtrend line on the hourly chart to signal a buy. If I do enter a position, I will use the break of the lower downtrend line on the daily chart to be my stop-loss. It can be enigmatic to calculate a stock’s price target, especially when the company is pre-revenue. In regards to FOMX, I will use the forecasted annual revenue estimates (Figure 15) to help determine price targets for 2020. It appears some of the Street’s analysts have different outlooks for Foamix in 2020 with the low revenues being $15.7M and the high being $75M. I see that $75M estimate to be very rosy for the first full year as a commercial company, so I will go with the revenue estimate of $44M. 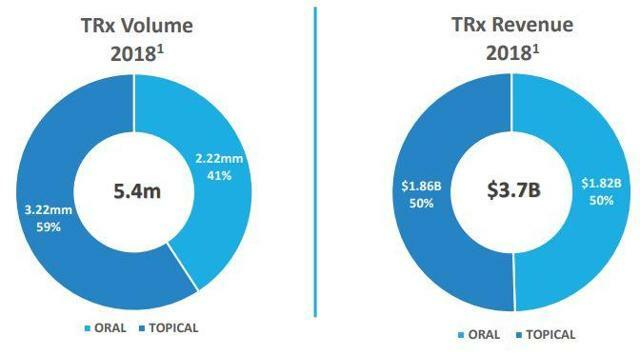 Using that revenue estimate and the biotech sector’s current price/sales ratio of 7x, I get a market valuation of ~$308M, which would give us a conservative price target of about $5.60 per share. I know this isn't an optimistic price target but I believe small-cap biotech stocks require realistic expectations until the company can prove it can outperform. Small-cap biotechs come with a multitude of downside risks that can decimate a share price. Foamix is no exception to this and exhibits the classic hallmarks of a speculative buy. The primary downside risk comes from regulatory actions. If the company cannot get FMX101 and FMX 103 approved, the company will have to spend more time and money for although the company expects to have enough cash to last through mid-2020, the company still experienced a net loss of $74.2M for 2018. I expect the company’s expenses to only grow as they acquire a sale force and prepare for a possible FMX101 launch. Therefore, I expect another offering at some point in 2020, possibly after FMX103’s potential PDUFA date. Another downside risk comes from the possibility the company's products will penetrate the market or does not get favorable payer coverage. This would hurt product revenues and will cause the company to miss earnings estimates. As a result, the market and investors would most likely create a massive shareholder fallout. As Foamix evolves into a commercial stage company, I see an opportunity to invest in a small cap stock that has the potential to create value for shareholders. The company’s two lead candidates FMX101 and FMX103 are getting close to the finish line with both having a decent commercial opportunity. In addition, the company still has some interesting products to keep investors interested in the pipeline, including FCD105. As the company moves closer to filing another NDA and their PDUFA date, I anticipate an increase in attention from the market. Biotech investors should see the potential for Foamix (Figure 16) and their healthy cash position to be worthy of a speculative investment. I am looking to enter before these anticipated events to take advantage of the discounted share price and evolving chart formation. I intend to hold those shares through FMX101’s PDUFA and will continue to hold if FMX103 is also approved. I will consider FOMX to be a long-term investment but will take some profits if it hits my first price target of $5.60 at some point in 2019. I will maintain my core position through 2020 as the company launches its products. If the company cannot gain FDA approval for one or both of their products, I will liquidate my position upon press release. Disclosure: I/we have no positions in any stocks mentioned, but may initiate a long position in FOMX over the next 72 hours. I wrote this article myself, and it expresses my own opinions. I am not receiving compensation for it (other than from Seeking Alpha). I have no business relationship with any company whose stock is mentioned in this article.